Just yesterday it was announced that Eddie: The Sleepwalking Cannibal will arrive theatrically and on VOD in just as few weeks and now we’ve got an official trailer as well as a very cool poster for you guys to dig on. The trailer is hilarious and I love the nice little spin on the whole cannibal idea — the guy just eats other people in his sleep… no biggie! 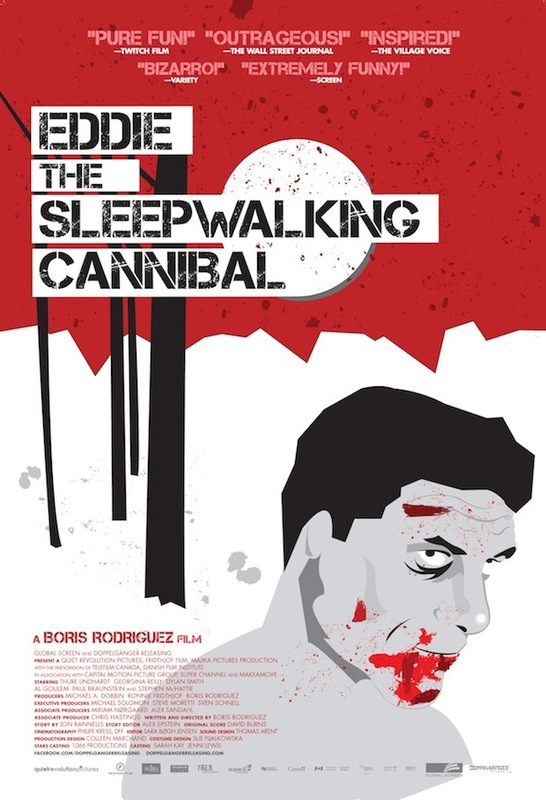 Eddie: The Sleepwalking Cannibal is a fresh, clever satire about artistic inspiration that pushes boundaries with its unique blend of offbeat humor, twisted friendships, sweet-hearted romance, and thegory realities of sleepwalking cannibalism. When Lars’s art dealer Ronny arranges a teaching job in a small town as a “therapeutic measure” to stir up his creative juices, things don’t quite turn out as planned. At first, life in the peaceful small town seems rosy, as he settles in and impresses beautiful fellow colleague Leslie (Georgina Reilly) by taking in the brawny, mute Eddie (Dylan Smith) after the latter’s caregiver passes away. But Lars soon discovers that the façade of serenity hides something unimaginable: Eddie suffers from a rare form of sleepwalking that transforms him from a docile, cereal-obsessed art student into a ravenous sleepwalking cannibal. Initially horrified by Eddie’s dark secret, Lars becomes enthralled by the not-so-gentle giant. Exceptional art comes at a very high price…and how far is Lars willing to go for his next masterpiece? The film was directed by Boris Rodriguez and stars Ulrich Thomsen, Wotan Wilke Möhring, Sebastian Blomberg, Katrin Sass, and Burghart Klaussner. Take a peak at the trailer below as well as the very cool new poster! Some fantastic new posters revealed for ‘You’re Next’!